When I played high school ball (a phrase that seems to engenderÃ‚Â me with some degree of credibility as a baseball writer but really means absolutely nothing), the whole team would be sent to the batting cages during a rain delay, presumably to make ourselves better or something equally ridiculous. Instead, we would all congregate in the middle and play two ball. For those of you who don’t know, two ball is a game where you stand in a circle with one player holding two baseballs. That person then throws them to another person who is expected to catch both. If one ball is dropped, that’s one out of the three with which you start. If bothÃ‚Â are dropped, the player is eliminated from contention. Last man standing wins. So, allow me to reintroduce myself Jay-Z style: My name is Wes, W to the E S, I used to write game previews on the weekends. 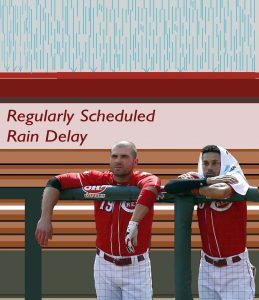 These days, I’m moving forward with your Regularly Scheduled Rain DelayÃ¢â‚¬â€an injection of fun every Friday into our largely humorless and sometimes hopeless Reds’ fandom. Trying to explain this column is a fruitless endeavor (kind of like Joey Votto’s batting averageÃ¢â‚¬â€.182, when will he ever figure it out?) mostly because I don’t understand it myself. It’ll be a column of columns, an ever-rotating circulation of irreverent half-baked ideas. Imagine a Redleg Nation version of Shea Serrano with less talent and less life experience. If you want more clarity, just look here, here, or here. To start the season off right, I’m going to introduce a new segment to Regularly Scheduled Rain Delay called “Choose your own Adventure.” Yes, I realize that with a new column every segment is new; just give me three weeks with this joke and then I’ll drop it. Also, these segments will eventually have banners like the nice one at the top of this article, I’m just lazy and Adobe Illustrator is pretty hard to use. Ever wanted to know which Reds player you would be if you were indeed a Reds player? Well I have the perfect five-question quiz for you to find out! The answers (decided by your final point total) will be at the very bottom of this article past the other two segments so you really have to make it to the end, but they’re there, I promise. Question 1: Billy Hamilton is faster than…? Question 2: What did you feel inside when Scott Feldman gave up a leadoff home run to start the season? Question 4: Will Joey Votto walk to first after only three balls this season? 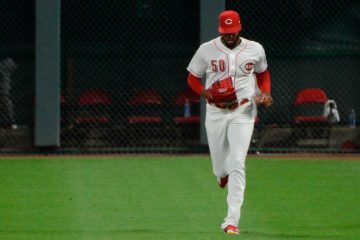 Question 5: The Reds play the Cardinals this weekend. Would you rather…? This is another new segment I’m doing, but unlike choose your own adventure, it’ll be a bit more reoccurring. The general premise is baseball teams have Kangaroo Courts, player-run systems that fine teammates for bad plays or just otherwise stupid decisions, and so Redleg Nation should have a Kangaroo Court of its own. Each week (if deemed necessary), a Reds player who made a particularly egregious decision will be fined by me. I am judge, jury, and litigator, but feel free to add comments from the peanut gallery. This week, the plaintiff is Scott Feldman (to no one’s surprise) for giving up a leadoff home run to the first batter of the 2017 season. Honestly, I don’t care if Feldman gives up a home run to 90 percent of the batters he faces as long as it ISN’T THE VERY FIRST BATTER OF THE NEW SEASON. I want to be excited about 2017. Not instantly demoralized. Thanks Scott. 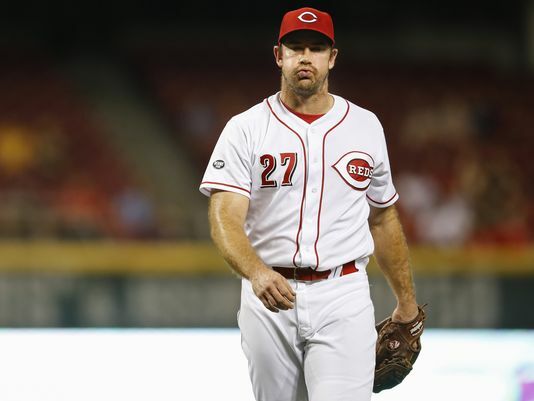 Fine:Ã‚Â Call the mother of every active Reds player and apologize for letting their son down. If no mother is available, take that player out to dinner. Doesn’t have to be nice (but with a $2.3 million contract, it better not be Skyline). So, I’m an uber-competitive person, which, as a writer, often becomes pent up emotion due to the lack of an outlet (RIP my baseball career). That said, I have still found ways to unleash my pettiness without standing on a mound, staring someone down, and desperately attempting to talk myself out of beaning them. This segment of the column will usually only be two sentences or so, but I would like to provide you all with a weekly update on my competitive outlets so that I can feel validated. The first: I joined a fantasy baseball league last year, missed the playoffs by one game, and am now coming back with a vengeance. Because this is only the first week, I cannot provide a standings update, but I can say that my team is losing 332-321 right now, my best starting pitcher is Dallas Keuchel, and I own 3/5 of the Reds rotation. The second: WordPress lets us see how many views our posts get, which shouldn’t mean anything but absolutely does because let’s be honest, we’re all vain. Anyway, I’ve made it my goal this year to finish atop the Author’s Most Views ranking. Currently, I sit in sixth, which is great because this website has like 20 writers so sixth is pretty impressive but also not great because Chad is in first and has ten times my views total. It’s going to be an uphill climb this season, but at least we’ll always have Joey Votto. 4-7 points: Bronson Arroyo Ã¢â‚¬â€ Generally a great guy, overwhelming optimistic about Reds baseball. Hey, you made the starting rotation, why wouldn’t you look on the bright side? 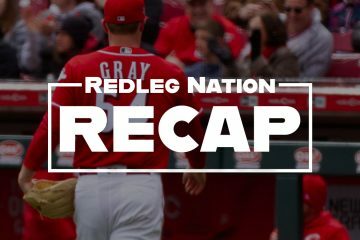 8-11 points:Ã‚Â Joey Votto Ã¢â‚¬â€ Emotion isn’t your strong suit but you command respect. When you enter a room, 90 percent of the people respect you and one guy insults Canada but you’re really too polite to call him on it. 12-15 points: Billy Hamilton Ã¢â‚¬â€ You’re the team jokester but more often than not, you take it too far. No, a hotfoot shouldn’t need a fire extinguisher to put out. We’re all friends here Billy, it’s just a joke. 16-20 points: Tony Cingrani Ã¢â‚¬â€ There’s a lot of rage in those eyes. Your nickname isn’t Kingpin for nothing. Maybe try to control yourself though…for legal reasons. Who is Cincinnati’s Best Young Starter? i look forward to this Wes. Those rain delay videos are amazing, my favorite was the jousting. Your article made me laugh out loud a few times, thanks! Wesley – This could be fun. Not as much fun as an infield tarp slip-n-slide, but pretty fun. There’s not much that’s more fun than an infield slip-n-slide (at least not that we can write about on a family friendly site) so despair not. Also I am apparently on the Tony Cingrani adventure whilst wishing I was on the Tony Soprano adventure though I suspect both have about the same endings. Finally, I admire your aspiration on views but would suggest that it’s an uphill climb. These guys will be tough to beat: Chad Dotson because it’s his Redleg world and we’re just commenting in it, Steve Mancuso because he really is the Tony Soprano of RLN, Patrick Jeter because obscure statistics, duh, and Mary Beth (whose last name I’ve forgotten forgive me young lady) because we’re all too polite not to read her posts especially since this site is low on estrogen and we want to encourage more female Reds fans maybe even a lot more and because she’s good with that humorishness stuff. But fifth place would be better than sixth amiright? Welcome back to the new year of baseballing. Go Reds! Well, you sold me, Wes! You are 6th, eh? Hmm… I’ll guess the 5 above you… Chad, Steve, Nick, Jason, Mary Beth? That’s my guess! Oh, and as I was reading your title, my brain auto-filled it with “Allow myself to introduce…myself,” from Austin Powers! You will now be referred to as Richie Cunningham. I got 11 points, so I barely snuck in as Votto (my favorite player) too! You’ll never catch me, Wes!!! Oh, and great stuff. Looking forward to this weekly column. Do you accept nominations for upcoming Kangaroo Court Fees? When Joey Votto thinks he is 1) Billy Hamilton, 2) Usain Bolt or 3) a cheetah, and gets thrown out badly trying to steal third in a one-run game, please litigate, adjudicate and pass sentence appropriately! Wes, you have a biting sense of humor, and an ability to write, not to mention an evident knowledge of baseball! I look forward to more from you. 9 points Wes! I’m apparently solidly Joey Votto. Now, if I hit half as well as Votto then I’d be enjoying my MLB retirement money right now instead of slogging away in Information Technology.